ONE OF US is a thriller involving a lost friend and reclusive cult. When journalist Melanie Roberts goes to the Ascension Family Commune, she finds herself in too deep and Haley nowhere to be found. ONE OF US was directed by Blake Reigle (Beneath the Surface, 2007). 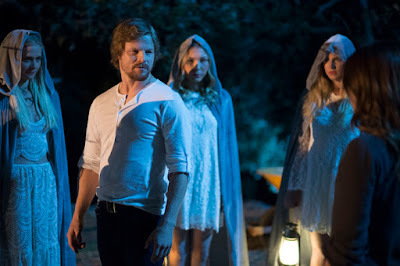 As well, the film stars: Christa B. Allen (Youth in Revolt), Derek Smith (Euogilia), Carly Schroeder, Chasty Ballesteros and Ashley Wood. This shocking title will show at online DVD retailers, this December, through Monarch Home Entertainment. On a mission to find her friend, investigative journalist Melanie Roberts tracks down the Ascension Family Commune and goes undercover to discover what exactly is happening there. Under the pretense of joining, she meets the charismatic leader and charms her way into the cult. But her friend Haley isn't there; and the other women are silent about her disappearance. Dark secrets are buried in the soil of the commune, and though she doesn't know it, Melanie is already in too deep. Monarch Home Entertainment will bring ONE OF US to DVD, mid-December. The release date is scheduled for 12th December. The film has not been rated and will be released in this format.